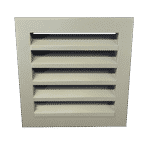 RCM has a long and distinguished history in the production of air ventilation products dating all the way back to 1948. Our extensive expertise places us a leading provider of high quality products at very competitive prices. With the services of our professional in house design team combined with the convenience of our local manufacturing facility, we are able to respond quickly to our clients needs, producing highly customised and bespoke designs. 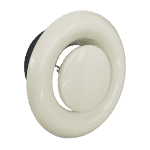 Having full control over the entire production run from initial concept, through the design process and then onto manufacture, means that unlike other ‘providers’ or suppliers, we set deadlines and make promises we can keep. Our Priority Order Service of our range of air ventilation products is now available for urgent small orders, samples, and missed items. We understand there will always be times when a fast turnaround is needed. Find out more about our priority service and contact one of our sales representatives to discuss your requirements. RCM Air Products offers a range of air distribution options for your projects providing the answers in one point of contact. Make just one call to discuss all your air distribution requirements. RCM Air Products will aid in the choice of products from start to finish. Reviewing competitively priced products from their range, RCM Air Products’ high level of service provides the complete package. RCM Products are delighted to present their trench heating, heated towel rails and their range of versatile radiators. The range offers many beautiful designs, colours and finishes all manufactured to the highest standard. 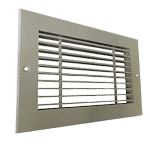 Our wide range of grilles offer controlled air duct ventilation for air heating systems, cooling with air conditioning and for use in natural ventilation installations. 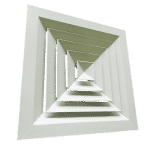 Our ventilation diffusers are carefully designed to disperse pressurised air exiting from heating, ventilation and air conditioning systems for a distributed air supply. Louvre panel systems, popular for many industrial and commercial buildings. Providing ventilation and controlling light entry yet offering screening and rain defence.